The nation's five largest banks have provided nearly $10.6 billion in mortgage relief to homeowners under a settlement that was struck with the states and federal government earlier this year, according to a preliminary progress report. The report was issued by the Office of Mortgage Settlement Oversight, which is monitoring the $25 billion settlement. In total, the five banks -- Bank of America (BAC), Wells Fargo (BWF), Citibank, JP Morgan Chase (JPMPRX), and Ally Financial (ALLYPRB) -- have helped some 138,000 homeowners and have offered relief averaging $76,615 per borrower between March 1 and June 30, the office reported. Nearly half of the total, $4.9 billion, comes from Bank of America. Ally Financial, the smallest of the lenders, has submitted just over $500 million in claims. 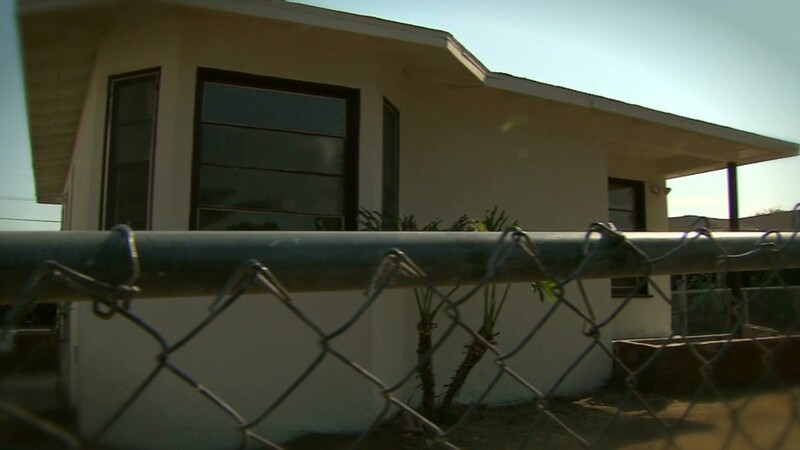 The settlement was meant to atone for foreclosure processing abuses dating back to 2008. Under the deal, which was approved by a federal judge in April, the banks get credit for helping homeowners avoid foreclosure, by doing such things as reducing the principal on loans and refinancing mortgages to lower interest rates. So far, though, most of the credits banks have received for relief efforts -- 80% -- have been for debt forgiveness for deed in lieu of foreclosure or short sales. In a deed in lieu, homeowners hand over ownership of their home to the bank in exchange for debt forgiveness. In a short sale, homeowners sell their home at a price that is less than what they owe the bank and the bank agrees to absorb the loss. In both cases, homeowners ends up losing their home. Not only that, but the hit on their credit score makes it harder to secure a mortgage in the future. Of the $10.6 billion in relief lenders have given to homeowners under the deal, $8.6 billion has gone toward short sales and deed-in-lieu of foreclosures, according to the report. 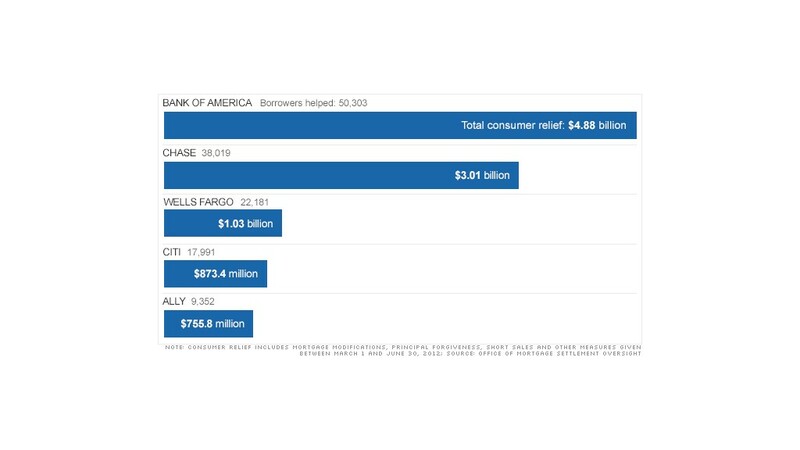 Bank of America provided some $4.8 billion in relief through this method, the most of any lender, while Chase came in second with $2.4 billion. "Short sales are quick and dirty [modifications]," said Geoff Greenwood, communications director for the Iowa attorney general's office. "That's why you're seeing more of them coming out of the chute." But there is a cap on how much lenders can claim for short sales under the settlement deal, explained Shaun Donovan, secretary of the U.S. Department of Housing and Urban Development. Once banks reach their limits, they won't be able to claim anything more under the settlement. Conspicuously lacking so far is anywhere near the $17 billion in principal reduction that lenders have promised under the deal. Lenders had said they would reduce the balance owed on mortgages for those who either owed far more on their homes than they were worth or who were behind on payments. The aim was to get the mortgage balance closer to the home's value, reduce the borrower's monthly payments and help them avoid foreclosure. However, only some $1 billion in principal reductions have occurred thus far, according to the report. Just 7,093 borrowers had their principal forgiven on their first mortgages -- for a total of $749 million. The remainder was on second mortgages. Of the five lenders, Chase had completed the most modifications on first mortgages, $376 million worth. In contrast, Bank of America submitted no modification claims on first mortgages between March and June. However, it has started nearly $2 billion trial modifications that were moving through the trial process, more than any other bank. In second place for trial mods was Chase with $1.2 billion that were offered or approved. Those numbers should increase dramatically, however, since many modifications have yet to be counted. Donovan said they structured the settlement to require borrowers to keep up payments during a 90-day trial period before they're considered successful modifications. At that point, the monitor will credit the cost of the modification to the bank's account. Currently, more than 28,000 trial modifications of all types are in progress, said Donovan. He said an additional $3 billion worth of modifications should be included in the first official report to be released in November. "The banks are heading in the right direction," said Donovan. "This will deliver real relief to consumers."